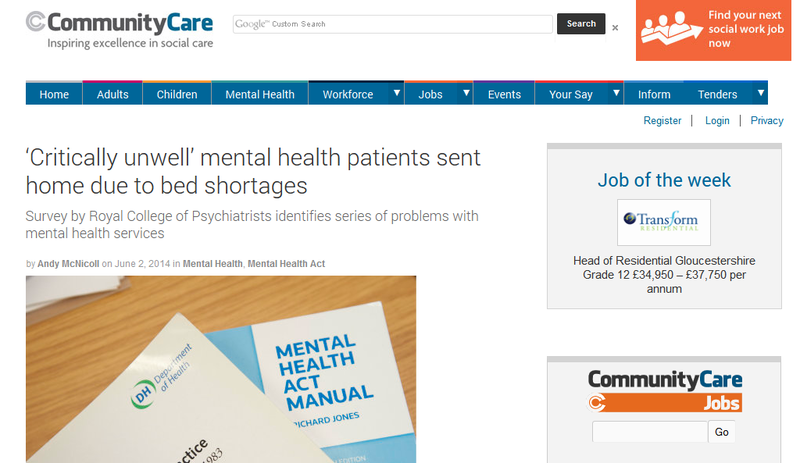 Sue Bailey, chair of the Royal College of Psychiatrists said that the survey findings showed mental health services were at a “tipping point”. “Continued cuts to services can only result in further distress and discomfort for patients, many of whom are young, vulnerable, some of whom are forced to receive care far from home. This situation is simply not acceptable,” she said. Steve Chamberlain, chair of The College of Social Work’s AMHP leads network, said that more evidence that hospitals were refusing to accept voluntary admissions was concerning. “The situation compromises staff’s professionalism and their ethics. We are under an obligation to follow the least restrictive alternative to detaining someone under the Act. If we are forced to increase restrictions for administrative purposes it is at the very least unethical. It is directly contrary to a key principle of the code of practice,” he said. Let’s not forget that Lamb’s local trust, Norfolk & Suffolk NHS Foundation Trust (NSFT) and his own clinical commissioning group, North Norfolk CCG, promised to put an end to the beds crisis five months ago, with a deadline of 30th April 2014. Yet the problems have become worse. At the meeting with NSFT AMHPs yesterday, the only response to the health, safety, legal and quality concerns raised was a Francis-Report-busting repetition by the NSFT Operations Director, Kathy Chapman, that financial targets have to be met: Chapman had no solution to the crisis that her ‘improvements’ has created. The ‘helpful’ suggestion from Clive Rennie, the mental health commissioner from North Norfolk CCG, was to persuade the local ambulance trust to drive people in crisis even further away from home, beyond its own boundaries, even though his own organisation has pledged to stop the use of out of area beds. Unfortunately, or rather fortunately, Rennie has failed to ‘commission’ his ‘solution’. Maybe, just maybe, we simply need sufficient local mental health beds and properly-staffed community teams and less money wasted on private hospital beds hundreds of miles away, temporary staff, political lobbyists, PR firms, outrageous salaries for CCG bureaucrats and disgraceful redundancy programmes?